Adolfo Domingo De Guzmán "Dolf" Luque (August 4, 1890 – July 3, 1957), was an early 20th-century Cuban starting pitcher in Major League Baseball. 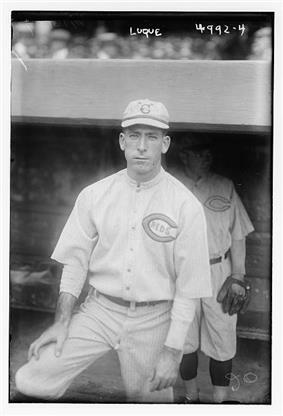 Luque was inducted into the Cincinnati Reds Hall of Fame in 1967. A native of Havana, Luque played winter baseball in the Cuban League from 1912 to 1945. He was also a long-time manager in the league. He was elected to the Cuban Baseball Hall of Fame in 1957. Luque was known to have a temper. While with the Brooklyn Dodgers, a heckler in the stands hollered "Lucky Luque! Lucky Luque!" repeatedly. Luque went over to the dugout and told manager Wilbert Robinson, "I tell you, Robbie, if this guy don't shut up, I'm gonna shut him up." "Aw, come on, Dolf," said the manager. "He paid his way in--let him boo." Just then the heckler spotted the rotund Robinson and yelled, "Hey, fat belly!" Robinson said, "OK, Dolf--go ahead and clobber the jerk." Luque obliged his manager's request. Luque's career Cuban League pitching record was 106–71. Luque is the all-time Cuban League leader in years pitching with 22, ranks second (behind Martín Dihigo) in wins with 106, and ranks seventh in winning percentage with .599. ^ Figueredo 2003, pp. 487, 509. ^ Figueredo 2003, pp. 95–96, 99, 103, 110, 114, 119, 123–124. ^ Figueredo 2003, pp. 130–132, 143, 145–146, 148, 151, 174, 177. ^ Figueredo 2003, pp. 203–204, 229, 243, 247, 262, 276–279, 410. ^ Figueredo 2003, pp. 502–503. Figueredo, Jorge S. (2003), Cuban Baseball: A Statistical History, 1878–1961, Jefferson, North Carolina: McFarland & Company, .